Don't you just hate reading a book that has been poorly edited and proof-read? This doesn't always happen with self-published authors, it happens with mainstream traditionally published authors as well. And then you get even more mad when you spot typos! I find when reading a self-published book I turn a blind eye to a couple of proof-reading mishaps, but when it happens in a traditionally published book I get angry. If you want to hit the big-time with your books, you need to make sure they are professionally edited and you can't neglect that. Same as you can't neglect a professional looking cover. True. It takes dedication and commitment to start and finish a book. There are the starts and stops, the times when, as an author, you doubt you have the skill to flesh out characters and develop engaging dialogue and riveting storylines. If you’re a working parent, not only must you meet the demands of a full-time job while creating your masterpiece, you also must find a way to nurture, guide and support your children. I can see you sitting up late nights staring at your computer monitor, waiting for a more robust plot to come to you, seemingly out of nowhere. Day after day, week after week you kept at it, and now you have a full manuscript in your hands. You are to be commended on having completed your book. So, here’s to you. Go grab a cup of tea, coffee, whatever you like to drink, then come back for a bit of surprising news. . . .
You’ve just started. You see, writing a first draft is the easy part. Now it’s time to start editing your novel. Although each writer is different, it’s recommended that you self-edit your manuscript at least two times. As a tip, if you find yourself defending parts of your manuscript (e.g. keeping a dialogue scene in when it doesn’t move the story forward), consider stepping away from the manuscript for a few days, maybe even as long as a week. To catch weak characters, unbelievable dialogue, run on sentences or abrupt time or scene shifts, consider reading the manuscript aloud. Your ears may pick up awkward spots in your story you would otherwise miss. You can also ask a friend to read a part of your manuscript to you over the telephone or in person. Pay attention to instances when the writing feels awkward or strained. Jot down the page numbers and paragraphs where this awkward writing occurs, so you can easily return to these scenes and edit them. Should you feel you don’t have the finances to pay for the services of a professional book editor, you can join professional writers critique groups. Both online and offline writers critique groups are available for you to join, whether you are a new or established writer. For example, some writers groups meet at local libraries or bookstores. Most of these groups require members to regularly critique each others’ work. For instance, writers might be required to read and critique two to three short stories, poems or novels that are written by other authors once a month in order to remain active in the critique group. The good news is that it’s generally free to join writers critique groups. By having your book professionally edited or critiqued, you can spot and strengthen weak plots, improve the pace of various scenes and ensure your sentence structure is strong. Getting your book edited by a professional editor may also increase the chances that readers find the story flows smoothly. In addition, book reviewers may appreciate reading and spreading the word about your professionally written and edited novel. Denise Turney is a professional writer who brings more than thirty-two years of book, newspaper, magazine, radio and business writing to a project. She is the author of the books Portia, Love Has Many Faces, Spiral, Rosetta’s Great Adventure, Long Walk Up and Love Pour Over Me. Denise Turney is an internationally celebrated author who is listed in various entertainment and business directories, including industry leaders such as Who’s Who, 100 Most Admired African American Women and Crosswalk. Denise Turney’s works have appeared in Parade, Essence, Ebony, Madame Noire, The Pittsburgh Quarterly and Obsidian II. I love traveling but I hate flying. For a start when you fly you are a long way from the ground. If you fall you are going to get seriously hurt. Then there is the uncomfortableness of being jammed between two seats, especially when the person in front puts their chair in the ‘sleep’ position. Now I know what a slice of ham feels like between two pieces of bread. Then there are the screaming babies who feel obliged to punctuate the night with their cries for attention. Even the complimentary headphones don’t block out the noise. I hate flying. It didn’t make it any better either when I went to board and they took me aside saying I was going to be moved to a different seat. 11G that I was booked on was an economy comfort seat. As someone had been prepared to pay extra for that seat, I was moved to 44D. It was only when I was walking past 11G with its extra leg room in the front of the plane to my seat at the very back of the plane that I realised what I had missed out on. I felt seriously aggrieved. So much so that I had to use all my strength to restrain myself from accidentally whacking the woman relaxing comfortably in 11G, with my laptop case. I think I might hate her, that unknown woman who stole my comfortable seat. Zurich was nothing like I expected it to be. Granted I am probably on the outskirts staying in some industrial area, but it doesn’t feel like a city. Definitely not a major city. And I haven’t left this area yet, having slept for 3 hours after checking into the hotel, and only walking 10 minutes to a nearby fuel station to buy some toothpaste from the little shop attached to it. No complimentary toothpaste at the Novotel Airport Hotel. Shame on them. Probably serves me right for forgetting to pack some in. I stood in the fuel station shop for a while scanning the shelves and seeing everything expect toothpaste. Then the word peppermint caught my eye and I figured it must be toothpaste. I’d been looking for a familiar brand like Colgate. This brand was Candida and I guess that’s what threw me. I mean get real. What company calls a toothpaste, Candida? And then there was the sign on the road that said Aus Fahrt. I’m not sure what that means but it sounds like Arse Fart to me. Maybe tomorrow when I leave this area Zurich will be more like the city I imagined it to be. But you know how you have perceptions of a place before you get there? So far all mine have been busted. Myth 1 – All men wear lederhosen. I have not seen any man wearing lederhosen. The closest has been men in cycling shorts. In fact, men dress here exactly how they do in summer in Cape Town. Myth 2 – People yodel on the street corners. I have not heard any yodelling anywhere. The streets are quite deserted, but I did see a group of young Koreans talking Korean. Myth 3 – The alps are covered in snow. I’m not sure if the mountains I see in the distance are the alps or not. But anyway, they are definitely only covered in thick green forests and there’s no snow anywhere. Myth 4 – Switzerland is freezing because it is always covered in snow. It’s frikking hot. Short sleeves and shorts weather and people here even have suntans. Myth 5 – International fugitives wander the streets looking for Swiss Banks to open up secret accounts in. I haven’t seen anybody remotely resembling a fugitive except maybe that group of Koreans. In fact, I haven’t even seen a Swiss bank. And no car chases, no CIA hunting down international spies and terrorists. Maybe I watch too many movies. Myth 6 – Cute wooden chalets with peaked roofs and those special gutters on the roofs to catch the snow. Only accommodation around here seems to be 5 floor apartment blocks. Not a wooden chalet in sight. Myth 7 – Everybody eats cheese fondue. I went to a restaurant tonight and had Zurich-style veal with rosti. Not a cheese fondue in sight. Myth 8 – Everybody eats chocolate. I have not seen any fat Swiss. They seem into health. Maybe all their chocolate is exported. I guess when I finally get to America all my perceptions will be busted as well. I might discover that not everybody has houses like the Kardashians and there is not a serial killer waiting to kill you in every city. America might prove to be just like Zurich Switzerland. Normal. Where people look like they do back home, dress like they do back home and drive the same kinds of cars. The only thing so far that seems to make Zurich different is the trains running down the middle of the road where the island would be. Whenever you cross a road you cross a train track as well. Maybe tomorrow I will see a man yodelling in his lederhosen while eating chocolate. After being an expat teacher for over 25 years, I really cherish the time to return home to Cape Town, South Africa during school holidays. Nothing beats seeing family and old friends. Not the exotic beaches in Thailand, delicious seafood in Goa or seeing Ankor Wat at sunset. Once I set eyes on Table Mountain dominating the Cape Town skyline I know that I am home. This time I returned home 2 weeks before the end of the school year. I'd been experiencing worrisome health issues, the result of a local doctor trying to give me alternate meds to the ones prescribed by my Cape Town specialist with disasterous consequences. It's taken 3 weeks but my specialist has been able to stabilise my blood pressure and pulse rate. It's just my blood sugar levels that is still not right. I know that it will come right in time. Of course all this medical stuff puts one off track and makes you lose focus. My writing was moved to the back-burner and marketing of my books became non-existent. I think that's one of the hardest things about self-publishing. You have to do your own marketing. The downside of that is when you are sick nothing happens. Everything grinds to a halt. Loses momentum, and you have to pick up the pieces and start again. Frustrating. But being home, seeing my mountain, surrounded by love makes it all bearable. Hush Baby is the novel I'm currently working on. I think it is going to be a goodie and I'm planning a great twist at the end. C U @ 8 has already received some good reviews and was my venture into the light-hearted fun side of life. With Hush Baby I'll be venturing back into the dark side to uncover more of humankind's cruelty to each other and how people react and deal with those kinds of situations. Defective, Not Telling and The Case of Billy B are all dark realistic fiction. The kinds of books I love to read. As a writer, one of the first things you have to decide on is Point of View. Whose point of view will you be writing from? This isn't as easy as it sounds and takes hours of agonising over before you start on any writing. I have used first person, multiple first person in that each character is the spokesperson for that chapter, and third person in my various novels. For me they all have their pros and cons and I can't really tell you which one is the easiest. You have to look at what you want to say and how best to say it. Dana Rongione, author of YA novel The Delaware Detectives, shares how she decided on the POV for her novel. Point of view (POV) is the perspective from which a story is being told. In essence, it is the element that shows us who is telling the story. While there are several different points of view, only a few are widely used. For now, I'd like to focus on first-person since that's what I used in The Delaware Detectives. The first person POV uses the pronouns “I” or “we.” In a sense, you (the author) become the character who is telling the story. This is becoming a very popular way to tell a story because it brings the reader directly into the mind of your character, and therefore, into the story itself. When using first person POV, since your character is telling the story, that character can only tell what he or she knows. In other words, if your character is in the kitchen, she can't tell you what is going on in the living room unless she can hear or see the action taking place. *Don't describe them – It has recently become acceptable to not describe your POV character at all as long as there is adequate description of the other elements in the story. The first-person POV is very popular, and so it would be in your best interest to master its usage. Remember, the main key is to know your character and to essentially become that character in the telling of the story. 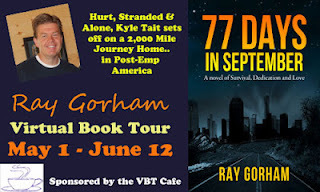 Ray Gorham was born in Calgary, Canada in 1966. Prior to graduating college and in the United States in 1991, Ray had the fortune to live in a variety of locations the world. Years in Australia, England, Lebanon, Japan, Canada, and the United States all helped to shape his background, worldview, and appreciation for other countries and cultures. Graduating with a degree in Accounting, he decided he couldn’t spend a future studying tax law and sitting in front of a computer all day, so he took a management position with Wal-Mart and spent the next 10 years in retail management where he had the opportunity to interact with hundreds of employees and thousands of customers on a weekly basis. Growing tired of large corporations, Ray next tried opening and running a restaurant, but decided after a year that wasn’t for him either. From there, he found a small log home business for sale in Montana in 2006 and settled in for what he hoped would be a long-term career. 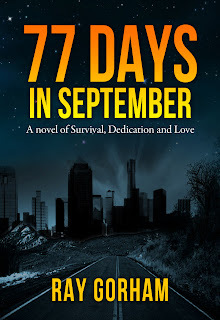 When the construction industry slowed down in 2008, Ray knew he was going to have a lot of time on his hands, so he determined to cross off one of the items on his bucket list—writing a novel. 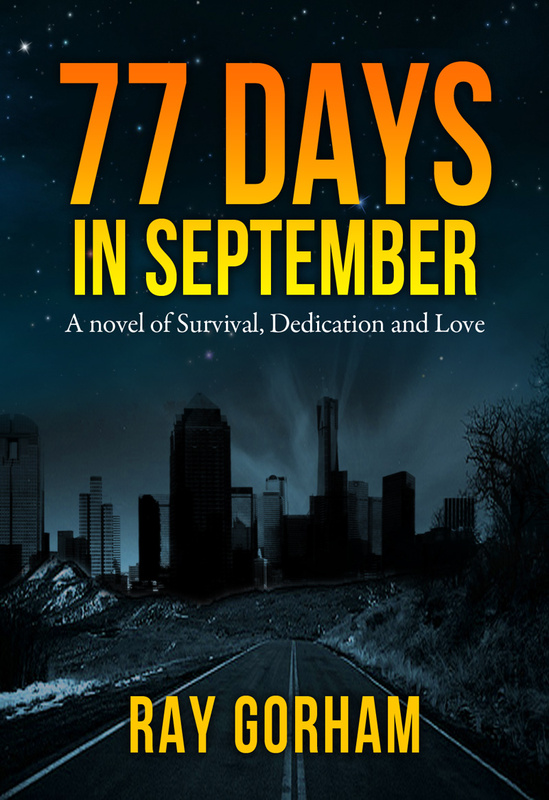 After thousands of hours of writing and editing he had the final draft of his first novel, a 108,000 word effort telling the story of a husband struggling to return to his family after a major terrorist attack. While agents and publishers have passed on his efforts to this point, he has found significant success so far in digital format, selling over 10,000 copies of his work. 77 Days in September Hurt, stranded, and alone, Kyle Tait sets off on a 2,000 mile journey home in post-EMP America.